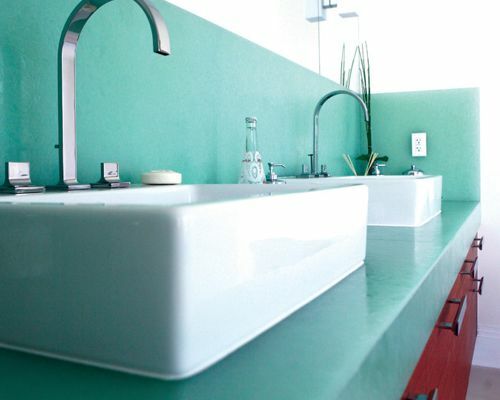 This article was originally published on Houzz on July 16, 2012, as "Green and Clean: Ecofriendly Bath Countertops" and is presented here with permission. Read the original article. 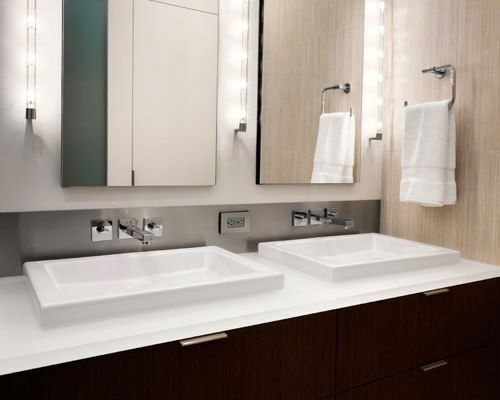 For countertops subjected to splashes and steamy shower moisture, durability is the name of the game—and recycled content adds to their green credibility. Thankfully, neither of these features mean having to compromise on looks. Whether your taste runs toward sophisticated or sassy, modern or traditional, there's a sustainable countertop for your bath. Photo credit: Lindy Donnelly; original photo on Houzz. Vetrazzo. Made of 100 percent recycled glass with a binder of cement, additives, pigments, big and bright chunks of glass, and other recycled materials, Vetrazzo is no shrinking violet. Fun options abound, including "Alehouse Amber," made of recycled beer bottles, and "Cobalt Skyy," made of recycled Skyy® Vodka bottles. As with any cement-based counter, it's porous, so you'll want to follow the manufacturer's recommendations for ongoing sealing. Heavy cement-based slabs such as Vetrazzo can consume a lot of transportation-related energy, so it's worth being aware of where the product is manufactured. Vetrazzo is fabricated in Georgia. Cost: $100 to $160 per square foot installed. Photo credit: Divine Design+Build; original photo on Houzz. IceStone. 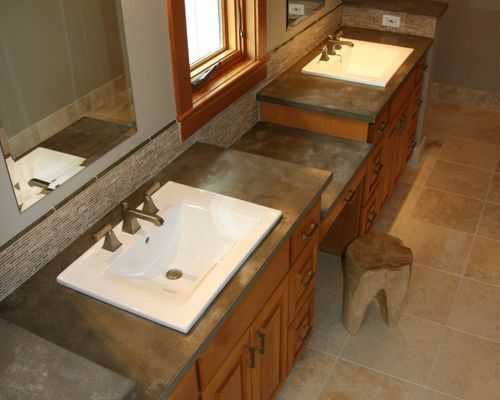 Countertops made of recycled glass with cement vary greatly in appearance. IceStone, manufactured in Brooklyn, New York, has smaller glass particles than Vetrazzo and provides a more subtle and refined character. It too boasts 100 percent recycled glass, to which only cement and pigment are added. IceStone has earned one of my favorite certifications, Cradle to Cradle, due in part to its reutilization potential. Cradle to Cradle's industry-independent approval is given to products that are safe for both people and the planet, and are also designed for a long life cycle. Cost: $40 to $54 per square foot for the material only. FUEZ. Manufactured at a wind-powered facility in Portland, Oregon, FUEZ is a mix of low-carbon cement, 100 percent recycled glass and natural aggregate. The company's products offer an unusually broad range of aesthetics, thanks to four different product lines featuring either large or small glass chips, stone or a monolithic colored cement. With 50 different products and options for customization, you're sure to find a countertop that matches your style. Cost: $20 to $50 per square foot for the material only. 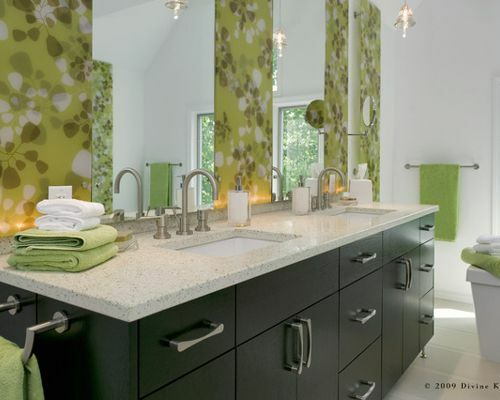 Photo credit: BioGlass Oriental Jade, original photo on Houzz. Bio-Glass. Bio-Glass, made of 100 percent recycled glass, achieves Cradle to Cradle certification and has an ethereal, translucent appearance. A simple but thoughtful application of Bio-Glass elevates this bathroom with its showstopping glow. 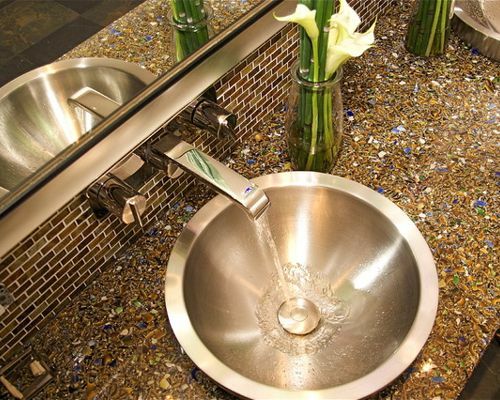 Beyond beauty, glass is nonporous, so the countertop is more hygienic and needs no ongoing sealing and maintenance. Cost: $85 to $115 per square foot for the material only. ThinkGlass. Our Canadian friends are behind the lovely and luminous ThinkGlass, an all-glass countertop made in part of recycled glass. In addition to ThinkGlass' recycled content, the company works hard to green the production line, such as using rainwater to operate their glass-cutting equipment. Cost: $200 to $400 per square foot for the material only. Photo credit: Starlight Countertop ECO by Cosentino; original photo on Houzz. ECO by Cosentino. 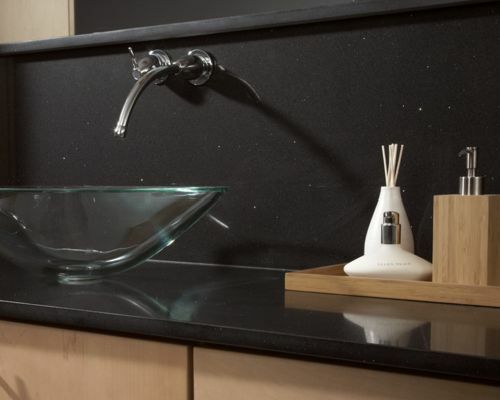 ECO, made by the same folks behind Silestone, is the go-to for sustainable solid surface countertops. Most solid surface countertops use a petroleum-based binder, whereas ECO has replaced that binder with a corn oil-based product. And the remainder of their makeup includes 75 percent recycled content from postindustrial and postconsumer sources: porcelain, mirrors, glass, stone and crystallized ash. Once installed, ECO's kindness continues with a nonporous surface that's hygienic and requires less maintenance over time. And with certification from both Cradle to Cradle and GreenGuard, which certifies building products for low chemical emissions, you can be sure that ECO is the real green deal. Cost: $68 to $118 per square foot installed. Photo credit: KUBE Architecture; original photo on Houzz. Cost: $28 to $105 per square foot for the material only. Photo credit: Agrestal Designs; original photo on Houzz. Squak Mountain Stone. Squak Mountain's countertop replicates the warmth and natural irregularities of stone with a matrix of recycled paper, glass and cement. This is a stout and durable countertop; however, as with concrete, it is susceptible to staining and etching. Either use extra care or embrace the patina. Cost: $30 to $40 per square foot for the material only.